After years of complaints, California is drastically changing the way it financially supports foster families. It's a move that aims to prioritize the needs of the state's 62,000 foster children and make it easier for grandparents and other relatives to care for them. Starting Jan. 1, California's foster care rates will be tied to the health and behavioral needs of each child. In the present system, the income of the home the child was removed from and whether the child was placed with relatives or non-relatives were bigger factors in determining support. The new system will replace a "tangled mess of rules" that ends up penalizing thousands of foster children who are cared for by relatives -- even though such children have better educational outcomes and less trauma when cared for by a person with family ties, says Angie Schwartz, policy director for the Alliance for Children's Rights, which advocated for the changes. "This is a very historic change in California," says Schwartz, whose nonprofit provides legal services for children in foster care. "This is the very first time in California's history that we will be treating our relatives and our non-relative foster parents equally." California Gov. Jerry Brown approved the new rate system in June as part of the state budget, and allocated about $40 million to begin implementing the payment changes. The policy is part of a larger effort that has been at least five years in the making to improve how children and youth do in the state's foster care system, the Continuum of Care Reform. The reform also aims to significantly expand mental health and other support services to all foster families, says Greg Rose, who oversees child welfare at the California Department of Social Services. "It is the major transformational effort that we are putting in place so that young people in foster care can have as traditional a family life as reasonably possible," says Rose, adding that a goal of the reform is to reduce the use of more expensive institutionalized group homes, where foster youth tend to have the worst outcomes. "Ultimately, we'll have healthier, happier youth that experience the foster care system," says Rose. The foster care rate changes will impact at least 10,000 families statewide who will be able to access similar resources as other foster families, says Rose. Over the next several weeks, a stakeholder group will define new rates, says Rose, which are expected to be at least slightly higher than they are at present. Once new rates are established county social workers are expected to begin assessing each child in foster care statewide to determine where the child fits in the new rate structure. In California, all foster parents -- whether related to the child or not -- must pass similar licensing and approval standards. But the stipends they receive may vary dramatically depending on whether they are related to the child. 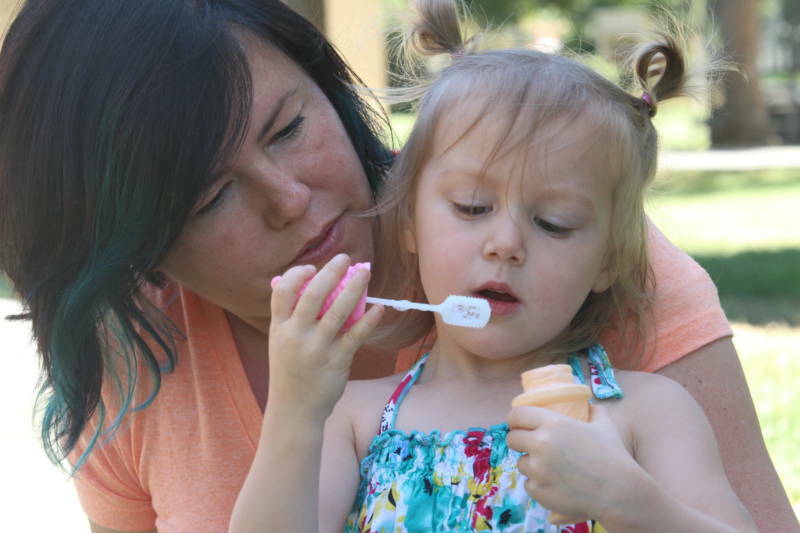 Donita Escamilla experienced the discrepancy first hand when she became a foster parent to her niece, Isabella, two years ago. While Escamilla received about $300 monthly to help care for Isabella, she would have received as much as $1,100 more is she were not related to the child. "I did not ever look at Isabella as a dollar sign. I was ready to take care of Isabella funding or no funding," says Escamilla, who was working as a waitress at a casino and already a single mother of four when she took Isabella in. "I knew that no matter what the struggle for me was, that that’s what was best for her, and that she needed to be with us," she says. "I just couldn’t imagine her going with strangers, with people that we didn’t know." The lack of resources was stressful, says Escamilla. Isabella's birth mother had used drugs throughout her pregnancy, and the newborn tested positive for methampethamines which has impacted Isabella's development and lungs. Escamilla spent sleepless nights taking the baby to the emergency room for bouts of asthma and bronchitis. Isabella's medical needs were covered through Medi-Cal, the state's insurance for low income people. But Escamilla worried about losing her job, and not being there for her other children. "I was always in this state of trying to balance the needs of my family as a whole, versus Isabella’s medical needs, trying to get people to take her to the doctor for me, not being able to miss work because she was ill," she says. Escamilla adapted. She left her casino job and opened a child care center so that she could care for Isabella herself, instead of shuttling her to other caregivers. She takes Isabella weekly for play, speech and other therapy sessions to aid her social and emotional development. Escamilla ended up adopting Isabella, so the new foster rate changes won't affect her, but she considers the development "a huge victory." She says she hopes other relative foster parents in the state won't struggle the way she did.